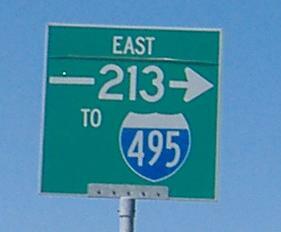 MA 213 Loop Connector is the road that makes the freeways around Methuen and Lawrence into a loop; I-93 is the west side, and I-495 is the south and east sides. It's not only a very short road, but the western interchange with I-93 is a design I've only seen along the Henry Hudson Parkway in New York - 213 WB to I-93 SB must merge with traffic from I-93 SB to 213 EB in a semi-loop. To picture this, pretend MA 213's western end is a rotary underneath I-93, and then erase the eastern part of the rotary (between the two sides of MA 213). No, it makes no sense, and there's plenty of room for a flyover from I-93 SB to MA 213 EB, a movement that can seriously back up even before peak periods. No, this was not designed with the possibility of extending MA 213 to the west. This and the sign at top were taken EB, though identical signs exist WB. I'm starting to develop the idea that BEGIN signs are used whenever a freeway route starts (see MA 3 and I-290), and not otherwise. 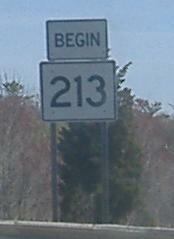 On the ramp from MA 113 to MA 213 at Exit 4. Look at that similarity in numbering and you'll see why the seemingly random 213 number was chosen for the Loop Connector. 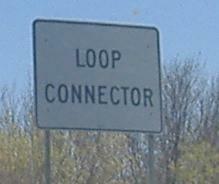 Drive the entire freeway eastbound just by clicking!